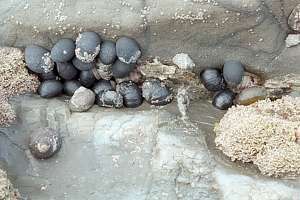 Many of the creatures that dominate the intertidal rocky shore, and that build the visible zones there, depend on the open ocean for their food, which is plentiful near the surface. Which organisms are so successful that they build the distinguishable zones? 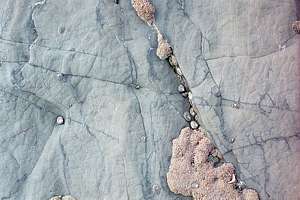 Since all life on Earth begins with plants, one would have expected to find abundant plant life in the intertidal zone. However, plants are not well protected to resist the brunt of waves and the threat of drying out. Those that do (crusts) are so hardy that they cannot be eaten. 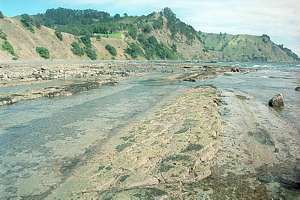 The photo shows intertidal zoning at the entrance to Whangarei Harbour, which is sheltered from large waves. The trees are Pohutukawa trees (Metrosideros excelsa), growing in a sparse layer of soil. In the undergrowth one finds hardy coastal species like coprosma and manuka and even the introduced gorse. Between them and the almost bare rock, one finds a small zone of hardy swamp flax (Phormium tenax) and some salt-resistant grasses and ferns. Then the soil stops and lichens begin, shown by grey, orange and black patches. Lichens end suddenly where the spring high tide begins. From there on down to the white barnacle zone, extends a semi-barren zone, covered in a thin smear of hairy algae that are grazed by small grazers like periwinkles (Austrolittorina sp.) and black nerita (Nerita atramentosa). The barnacle zone has a sharp upper boundary where brown and sheet barnacles reign supreme. 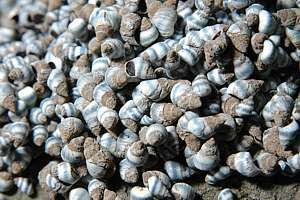 Slightly lower down other shelled animals can survive, like flea mussels and oysters, mixing in with barnacles. From this zone down, one should also expect encrusting coralline algae rendering a pinkish colour cast to the shore. Lower inside the mid-intertidal, carpeting moss weeds survive, and close to the spring low tide, brown seaweeds. The sequence of 'succession' from high to low, has a surprising variability that depends on known factors such as wave exposure and pollution, but brings surprises as well. 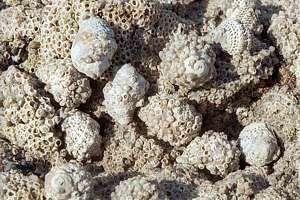 In general one can say that some barnacle species are the most hardy and capable of surviving without food. After that the sessile molluscs like mussels and oysters. They all live from plankton, imported from the open sea. 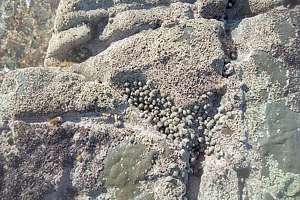 Of the plant species, the coralline algae are the most hardy, followed by encrusting red algae. 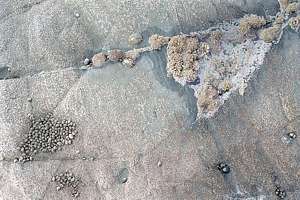 Grazing snails can never become zone builders as they are one tier up in the food chain, depending on sessile algae that are but a thin smear over all else. Scavengers and predators occur in even fewer numbers for the same reason. The best way of learning about the rocky shore is in being there during optimal conditions (extreme spring tide during the day with bright sunshine and few clouds, and very little wind), and then coming back many more times. The images in this section hope to show some of the principles and factors mentioned in the previous chapter. f009524: Echinoderm Flats near Goat Island were formed from slightly sloping layered sandstone/mudstone. They are also located just above the lower littoral fringe, best visited during spring low tides. The sloping layers give rise to long rock pools and flat stones covering these, which is ideal for the survival of sensitive shore life. f009532: cracks and hair cracks store moisture, which invites shore animals like snails to establish their homing spots there. Notice that the junctions of hair cracks are favourite places. 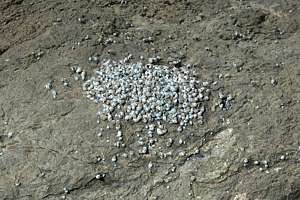 Note that many snails return to a precise homing spot after grazing the area around. f009534: an even rock surface has a small rock pool (top right), recognisable by a growth of pink paint and turf. The whole area is covered in sheet barnacles, food for oyster borers who are huddling for survival at bottom left. Together they willl march up. 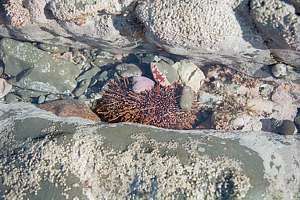 Note that the area around the rock pool is grazed so well that sheet barnacles could not settle there. Notice the small depressions where larger snails seek survival. 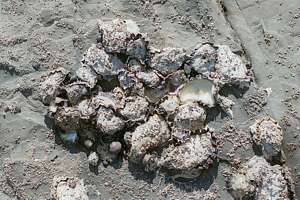 f009507: dense sheet barnacles are just out of reach for oyster borers huddling in a depression. The time that this area is submerged is just too short for breaking into a barnacle and eating it. In this respect there is always enough time for grazers to complete a meal. 0609131: these small periwinkles risk being washed off this rock but the weather is calm and they have congregated for spawning. 0609133: although these tiny periwinkles are hermaphrodites, being both male and female, they nonetheless prefer to reproduce sexually, even if that means running the chance of being washed off the rock. f009535: black nerita snails and a few grooved snails huddling in a moist crack during low tide. Black neritas are well adapted to survival out of the water. Notice how pink turf is capable of storing and releasing a lot of moisture. Notice also how well the rock is grazed. f009602: Grooved snails (Melagraphia aethiops) huddling against the moist 'forest' of pink turf (Corallina officinalis). 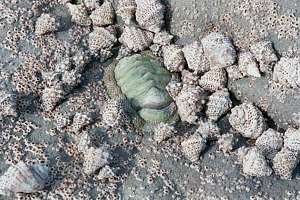 Notice how well the rock is grazed, even though a few sheet barnacles (Elminius modestus) have been able to establish themselves. 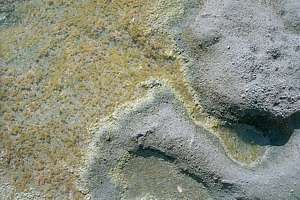 Coralline turf not only holds moisture well but it also enlarges the surface area of the rock considerably for algae, minute grazers and amphipods. While the tide is out, the green algae within the turf can keep on growing at elevated temperatures. It is a highly productive environment. f009603: the same moist spot chosen by a large snakeskin chiton (Sypharochiton pelliserpentis) also attracted oyster borers (Lepsiella scobina) . Note how well the sheet barnacles have been predated on, showing dark openings on top. f009621: native rock oysters (Sacostrea cucullata) also appear to huddle, even though they cannot move. Oysters prefer to live in sheltered conditions, such as on the sheltered sides of large stones because only when not tossed about, can an oyster larva settle itself. 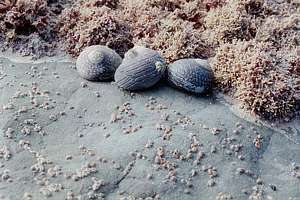 f009514: a healthy rocky shore is characterised by a dense cover of life, as shown here. 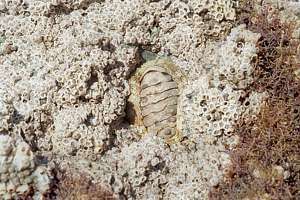 The snakeskin chiton is threatened to be cemented into place by a dense sheet of modest barnacles. On right the turfing brown Gelidium caulacantheum. f009515: oyster borers collectively attacking sheet barnacles. By staying together, the oyster borers are better protected against drying out. Note how sheet barnacles are also growing on their backs. f009504: a stable rock pool with featherweed growing on those rocks that are least likely to be turned over by storms, unlike the smaller stones shown on right. These should all be covered in pink paint, unless turned recently, showing their shaded sides. Barren rock is a sign of recent movement. f009510: young sea urchins never show themselves in the open, leading cryptic (hidden) lives under rocks, in the gravel, but always completely submerged. Here is a sea urchin in a narrow rock pool. By night at high tide it comes out to graze the rock in the foreground. Otherwise it burrows between the rubble. Sea urchins can feed entirely from broken seaweeds passing by, which they catch with their top tubefeet. f009636: a shallow rock pool covered in a thick carpet of green algae. Why is this pool so poorly grazed? Many people walk here and they could have crushed grazing snails underfoot. This rock pool is so shallow that it may dry out on hot days, which can kill snails too. There is no cover of pink paint. f009634: a deep rock pool with steep walls, densely covered in necklace weed and coralline algae. 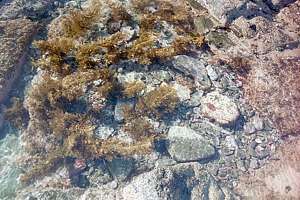 These seaweeds are well grazed, as only few carry hairy green algae. (these details are not visible on this small photo). 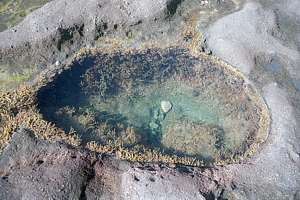 An interesting question: how was this rock pool formed?